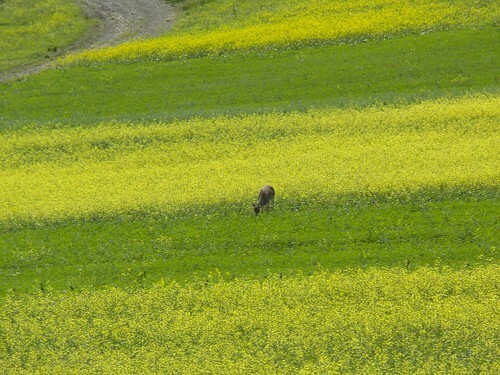 154/365 Deer and mustard, originally uploaded by phlegmmy. For once I didn't mind being at a stop light. I was on my way home from the farm when I spotted two deer in this hayfield. I grabbed my camera and just took a shot before the light changed. I wasn't able to get both deer, but felt lucky to even get the shot off from the car. LOL! That is a stunning shot! Looks like that deer has good eating.